We know that hiring a skip in Waltham Abbey isn’t easy. There are so many suppliers clamouring for your business; how do you know which is the best skip hire company to choose? Away With It have been providing Waltham Abbey with skip hire services for over 10 years and, as we are located just 15 minutes away in Buckhurst Hill, it means we can offer you a speedy and cost-effective local service. Skip Hire Or Two-Man Waste Removal Team? At Away With It we like to do things a little differently. 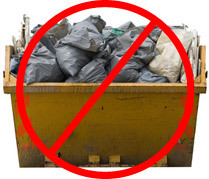 We won’t just turn up to your property with an unsightly skip and let you just get on with it. We offer traditional skip hire, as well as a range of other waste removal services that can help make your life easier. What this enables us to do is offer you a range of services that have the potential to save you money and effort. One of our alternatives to the very popular skip hire service is a two-man waste removal team. Depending on the volume and type of waste you are looking to get rid of, you may well find it cheaper and easier to let one of those two-man teams come to your property, load up their van, and then take it away on the spot. This eliminates the need for a skip to be outside your home and for you to do any heavy lifting. You are more than welcome to call us to discuss your options as we will always point you in the right direction as what is best for you and your budget. Both skip hire and waste removal teams have great advantages, so we will help you make an informed decision. We know that you are busy, which is why we focus so intently on flexibility and timelessness. We are open seven days a week between 7am and 11.30pm, meaning we are always available and can tailor your service to you. Once you have decided on the best service for you we will provide you with a guaranteed two-hour timeslot. We will give you a ring in advance to let you know we are on the way to your property, just to keep you in the loop. What’s more we’re able to arrange early morning, evening or weekend pick-ups, and often within a matter of days. Depending on work load we may even be able to collect on the day! If you value your time why not give us a call today to see how our skip hire and waste removal services stack up? Depending on the size of the job we may be able to give you a no-obligation free quote over the phone. If not, one of our friendly team will visit your property to assess the job and provide you with a quote that way. You are under no pressure to accept, please feel free to go away and think about it. Possibly the best thing about the Away With It experience is that our waste removal service only charges you for the space you actually use. This means you could save quite a bit of money! Whether you’re looking for waste removal or skip hire in Waltham Abbey, why not give our friendly team a call today? The sooner you get in touch, the sooner you’ll be free of that rubbish. Simply call us on 0208 504 7390 or 07957 123019.